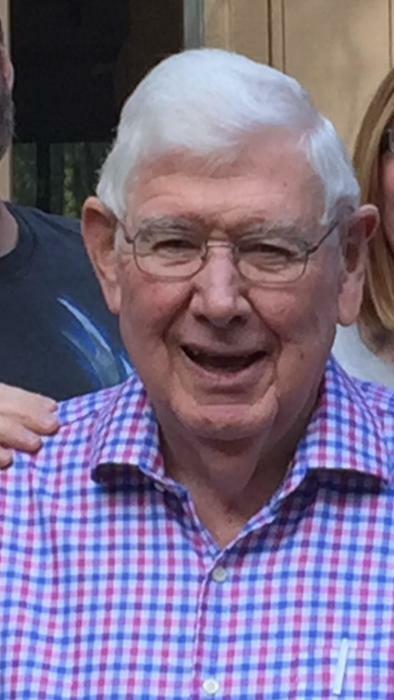 80, of Hilton Head Island, SC, formerly of Cumberland and Pawtucket, passed away on October 10, 2018. He was the beloved husband of the late Sheila (Sartini) McHale for 52 wonderful years. Born in Pawtucket, he was the son of the late Francis and Jane (Meehan) McHale. A Rhode Island resident until he and his late wife retired to Hilton Head Island, Tom worked much of his professional life in a family-owned business, Pawtucket Ready Mixed Concrete Co. and John J. McHale and Sons, retiring in 2000. He was involved in several professional and volunteer organizations, including: Past Chairman and Honorary Director, National Ready Mixed Concrete Association; Member of the first Board of Directors of Beacon Mutual Insurance Company; Member of the Board of Directors of the Northern Rhode Island Chamber of Commerce; Member of Notre Dame Alumni Association; Past Chair of the Pawtucket Kiwanis Club, and active in the Hilton Head Kiwanis Club, with a combined 48 years of service. He was well known and loved for his generosity and frequent random acts of kindness. Tom was also active in the reform of worker’s compensation in Rhode Island, and was a candidate for public office (RI Senate). He is pre-deceased by his wife Sheila, and survived by his children Alan and his wife Nicole of Coventry, RI; Kim Keck and her husband Phil of Providence, RI; and Melissa Tarantino and her husband Tom of Fort Mill, SC. He was also the cherished grandfather of five grandchildren, Kathleen Foran-McHale, Allison Foran-McHale, Laura Keck, Thomas D'Andrea (spouse Katherine), and Elizabeth D'Andrea. He is also survived by his four sisters: Jane Beard (spouse Louin), Christine OConnell (spouse Vincent DiBenedetto), Julia McHale and Mary Yeager. Calling hours will be held on Friday, October 19, 2018 from 4-7 PM at Manning-Heffern Funeral Home, 68 Broadway, Pawtucket. The service will be held Saturday, October 20, 2018 at 10 AM in the funeral home with a burial to follow at Mount Saint Mary Cemetery in Pawtucket. Donations in lieu of flowers may be made to Hospice Care of the Low Country, PO Box 3827, Bluffton SC 29925. For additional information and online condolences visit: manningheffern.com.